doctors are highly respected professionals and are expected to behave like one. Yes, we are humans but once we enter certain profession, there are certain ethics and professionalism to hold on to. Similar to why we get sued when as human we do make mistakes. I work in NZ where maternity care is midwife-led and public patients only meet the doctor if the midwife is not happy with the pregnancy/delivery. Unfortunately even for a “developed” country like this where they are supposed to be trained professionals, a lot of mismanagement still occurs. (After all, it is the only thing they do, and nowadays midwives here don’t have to do nursing first – they can come from any background and do a Bachelor of Midwifery). Home birth is a step back to the dark ages. Do we want to go back to the maternal/perinatal morbidity and mortality rates from those times? The public does not appreciate that while childbirth is a natural event that does not mean it is fraught with risk, and as I see every few months with my own eyes things can go from smooth-sailing to a disaster in a split second. One maternal death that could have been avoided by a hospital delivery is one maternal death too many. 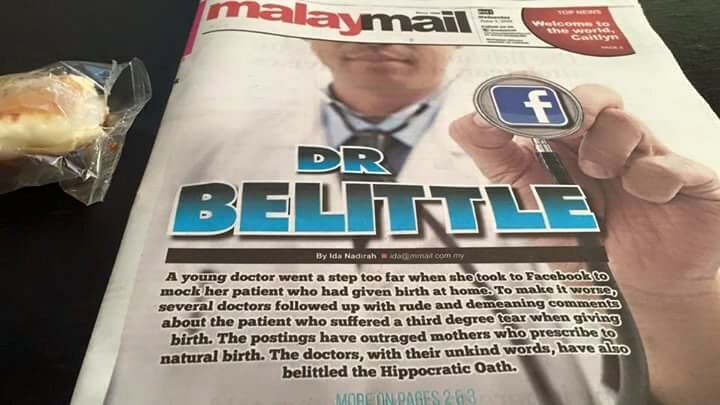 If a place like New Zealand has yet to fine-tune their midwife-led maternity service for both hospital and home deliveries, Malaysia certainly isn’t any more suitable. Even a lone doctor would be hard pressed to deal with obstetric emergencies in a home setting, never mind a midwife or doula. That said, I agree that all you can do is educate the patient to the best of your knowledge. If they do anything against medical advice that is a risk they are taking. The big problem nowadays is that they don’t acklowedge that and expect us to have superhuman powers that can revive a patient in cardiac arrest due to an amniotic fluid embolism or a terminally ill one with metastatic disease that has been allowed to spread due to the refusal of modern, evidence based therapy. We in turn get blamed and crucified for every eventuality that ultimately results from their decisions. in my college the lecturers stressed heavily regarding patient’s confidentiality…one time a student posted on fb abt a patient’s case n eventually it reached the management..the whole batch was punished..im actually quite ashamed to be part of this ‘strawberry generation’, the only thing we do is complain complain complain without realizing how small of a burden we share compared to our previous gen.. In this case, i stand with Dr P, if a patient comes with an emergency, just treat them and dont make a big fuss out of it. What did u do your mbbs for if not for treating patients? People make mistakes and its our job to help fix it, but ridiculing others doesnt make things better. All i see among nowadays housemen is incompetency and lack of patient-doctor rapport, its as if their MBBS degree was purchased online…such ease… hopefully the future generation doctors won’t repeat such humiliating mistakes that our generation make..
1- Why there is no home visit done to visit client and to address the reason why the client does not want to come to clinic/hospital? 1- I respect the client’s autonomy for not seeing me / follow advice given. 2- I follow my job scope and responsibility –> to see and to give appropriate treatment any client (whether defaulter or not) when they visit to hospital / clinic. Yes, indeed. Those are exactly the same questions that will be asked! MENURUT PERINTAH………. Who cares about the doctors? Let me put it this way…everyone will die. its just the way of dying may differ. If they choose to die giving birth, no one can stop it. It’s a pity that they make a poorly informed judgement/decision. I am frustrated as TCM claim a doctor tittle in front, even claim to b a professor of medicine, oncology and women health and etc , god knows how they got it. They tend to specialise in multiple discipline and even claim to b able to cure metastasis cancer. I am speechless, frustrated and even angry but I don’t want to sound condescending to them. I can’t do much and just do my job as a doctor, an evidence base medicine. This is so sad ppl tend to trust them more thn us. Proper training in ethics and confidentiality is imperative. Hope we don’t end up like this. Now, what makes me think we may be heading that direction? We are not very far from this!